My husband Chuck and I have just been published by O-Books. 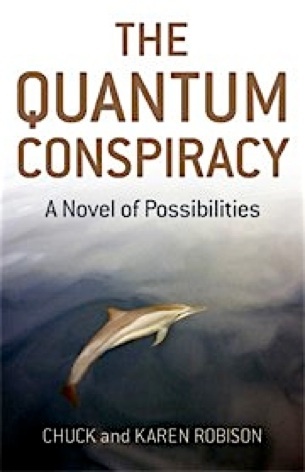 The Quantum Conspiracy is a Novel of Possibilities. This book recounts the journey from the constellation Sirius of twelve pioneers and their teams of specialists who come to Earth to assist in the transformation of the human species to a higher rung on the evolutionary ladder. The book discusses the trip here, the skills they bring for the mission, how they reconnect and what they learn and accomplish in the process. It also discusses evolution, the Indigo and Crystal Children, the Hopi Prophesies for our time and the dangerous geopolitical situation now confronting America and the world. Additionally it describes what the transformation finally creates on Earth, to the surprise of everyone. From the Present Crisis of today to the Golden Age beginning in 2012, these twelve saw the big picture from the beginning of their training for the mission to Earth and participated with their unique talents in the creation of the greatest leap in the history of man. Starting with a quote from the scientist Rupert Sheldrake appearing on the radio show “What If It* Really Works?”, the reader is taken through the stages of a journey that is happening right now and in our own galaxy. I included many of the spiritual teachings that have been helpful to me along the way and I think you will enjoy this story and walk away with new information about the questions that we are all dealing with right now. The Quantum Conspiracy is now available from Amazon as an eBook or Kindle edition. Hard copies are also available at Amazon.